Members of the Prince George's County Fire/EMS Department including career, civilian and volunteers paid their last respects today for an Alexandria Paramedic that made the ultimate sacrifice last week. A Memorial Service with Honors was held today for Paramedic Joshua A. Weissman that died after falling from a bridge overpass while tying to access possible patients involved in a 3-vehicle crash with auto fire on Route 395 in Alexandria. Prince George's County Fire Chief Marc S. Bashoor, Deputy Fire Chief Frank Underwood and dozens of Fire/EMS Department members attended the services at the Beth El Hebrew Congregation. The Fire/EMS Honor Guard participated in the Memorial Service as well as honor guards from the County Police Department and Department of Corrections. Prince George's County filled in Fire/EMS Stations in Alexandria and PGFD Fire Boat Lawrence Woltz extended their area of protection to include Alexandria, VA. By providing this staffing and coverage, Alexandria Fire Department personnel were able to participate in the viewing and memorial services. The entire membership of the Alexandria Fire Department escorted the body of Joshua Weismann up Seminary Road to the Beth El Hebrew Congregation for memorial services. Our thoughts and prayers will continue for the family and friends of Joshua Weissman and the Alexandria Fire Department during this difficult time. Just after 2:00 am, Wednesday, February 15, a single vehicle motor vehicle crash occurred critically injuring the driver and occupant. Firefighters, EMT’s and Paramedics from Bowie Fire/EMS Stations and a heavy-duty rescue squad from Glenn Dale were alerted to the incident at Stonehaven Lane and Stoneybrook Drive in Bowie. A single vehicle, for unknown reasons, left the roadway and hit a tree. Two adult males, both in their early twenties, were trapped in the vehicle. Both occupants required heavy-duty hydraulic extrication tools (Jaws of Life) to free them. The passenger was extricated first and transported to a Trauma Center by a Paramedic Unit in critical condition. The driver extrication was more challenging and required extra time to complete. He was extricated from the wreckage about 30 minutes of arrival of firefighters. He was treated on the scene by paramedics and flown to the University of Maryland Shock Trauma Center in Baltimore on-board Maryland State Police Trooper 2. One of the first arriving units was the ambulance from Bowie Fire/EMS Station 839. Travis Murdoch was the person riding in the position on the basic life support ambulance that would be responsible for initial triage, assessment and treatment of the injured. It did not take long for Volunteer Firefighter/EMT Murdoch to see that it was his twin brother critically injured and trapped inside the vehicle. Murdoch’s brother, Chris, is also a member of the Bowie Volunteer Fire Department. As everyone can imagine emotions were high on the scene, however, personnel continued to work diligently to extricate, treat and transport the injured patients. Travis Murdoch is employed as a police dispatcher at Prince George’s County Public Safety Communications. Fire Chief Marc Bashoor recently recognized him for his efforts in assisting in the rescue of four occupants of a burning Bowie house as well as his selection as Volunteer Fire Fighter of the year by the Knights of Columbus. Travis is with his brother at the Trauma Center in Baltimore accompanied by family, friends and members of the Fire/EMS Department. As of Wednesday evening, Chris Murdoch remains in Critical Condition, however is stable. He underwent numerous treatments and a surgery on Wednesday. The other patient remains in critical condition at a local Trauma Center. The City of Bowie Police Department are investigating the crash. 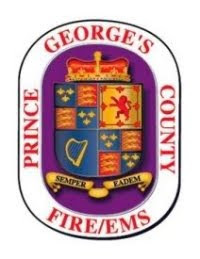 The entire extended family of the Prince George’s County Fire/EMS Department; career, civilian and volunteer, has the Murdoch family in their thoughts and prayers during this difficult time. One of our members, Chris Murdoch from Station 39 (Bowie/Belair), was involved in an accident early this morning. He is currently at Baltimore Shock Trauma in serious condition. We ask that you please keep Chris and his family in your prayers. Update: On behalf of Chief Havens, President Bigony, and the members of the Bowie Volunteer Fire Department we'd like to thank everyone for their thoughts and prayers for the Murdoch Family in their time of need. Your support means a lot.